Discord is a popular IM client used by gamers, redditors, Patreon creators to chat and share media on. It rose to popularity in the past few years owing its success to the game streaming community. The app is featured among several lists of top 10 messaging apps among the world. Yes, it’s that good. The developers behind Discord have been adding new features to it after listening to user feedback. The latest among them is the addition of “Spoilers”. Spoilers are basically hidden messages which can be seen by clicking on them. Users usually use them to share something without spoiling the fun or suspense for others in a group. For example, the climax of a movie, a twist in a book, etc. In the new update for Discord, users can mark spoilers in the messages they send. 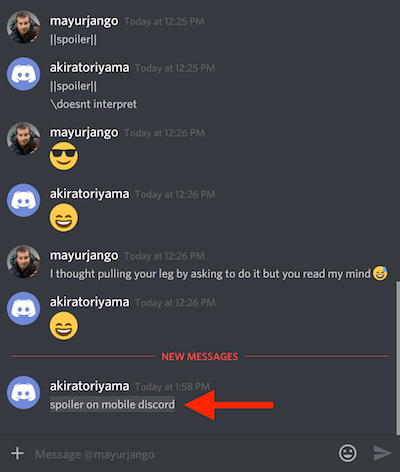 Here’s how you can do spoilers on Discord on a desktop client, Android, iPhone or iPad. In a chat, highlight the specific part of the message you want to mark as a spoiler. Right-click on it and select “Mark as spoiler”. There are two other methods to mark a spoiler on PC. Use Markdown Syntax – Wrap the text in bars ||like this|| and they will show up as a spoiler. Use /spoiler function in chatbox – Add /spoiler before any message to mark it as a spoiler. Tip: It’s also possible to mark attachments such as an image or video as spoilers on Discord’s desktop client for Windows, macOS and Linux. To do so, upload the attachment and tickmark the “Mark as spoiler” checkbox before hitting the Upload button. Meanwhile, you can mark a link as spoilers irrespective of the platform. This is a universal method for both Android and iOS apps of Discord. Open a chat inside Discord app. Wrap the text in bars ||Insert spoiler|| and they will appear as a spoiler. Inside the chat, highlight the message and long-press on it. Select “Mark as spoiler” option. To view a spoiler, simply click or tap on the spoiler box shown in black colour.